Astronauts aboard the International Space Station are preparing for the deployment of nearly three dozen tiny satellites from the orbiting lab over the coming weeks. The spaceflyers have been installing special equipment that will launch 33 "cubesats" from the space station this month, with the first round of ejections scheduled to take place on Thursday (Feb. 6). NanoRacks helps organize and integrate some research activites aboard the space station. The company built eight new deployers that will launch the 33 cubesats, which were delivered to the orbiting lab Jan. 12 on the first contracted cargo mission of Orbital Sciences' unmanned Cygnus resupply spacecraft. Six cubesats will be launched from the station Thursday, NASA officials said. The rest will begin flying freely over the course of the following two weeks or so. Twenty-eight of the 33 cubesats were built by the San Francisco-based company Planet Labs. 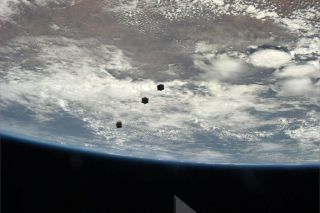 Together, these spacecraft make up "Flock 1," which Planet Labs says will be the world's biggest constellation of Earth-imaging satellites. The Flock 1 cubesats measure just 12 inches long by 4 inches wide by 4 inches tall (30 by 10 by 10 centimeters), but they can take images with a resolution of 10 to 16.5 feet (3 to 5 meters). Flock 1 is designed to deliver frequent, low-cost and high-resolution imagery of Earth that could benefit humanity in a number of ways, such as monitoring deforestation and tracking natural disasters, company officials say. "We'll be producing imagery of the whole Earth with unprecedented frequency," Planet Labs co-founder Will Marshall told Space.com late last year. "We will thus be able to always be covering the whole Earth, not just pointing and shooting at specific targets." Among the other five cubesats to be deployed this month are two spacecraft from Lithuania and one from Peru, Johnson said. "These satellites will turn these countries into spacefaring nations," he said. "They're the first satellites to be deployed in space from these nations." The 33 cubesats will enter Earth orbit a bit below and in front of the International Space Station and thus will not pose a collision risk to the $100 billion orbiting lab, Johnson added.